A triumph of comic irreverence and dramatic purpose, Episode VIII dazzles like the sci-fi saga hasn’t in decades. Rolling up with the kind of intergalactic swagger that gives us a cosmically infuriating phone prank within the first five minutes, ‘Star Wars: The Last Jedi’ is a work of supreme confidence: witty, wild and free to roam unexplored territory. 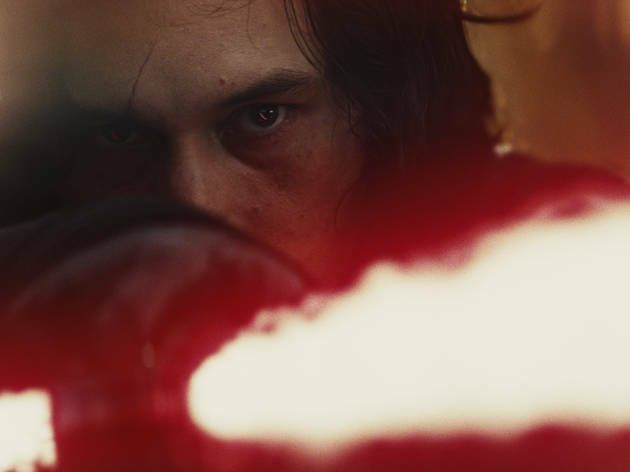 If JJ Abrams’s franchise-rebooting ‘The Force Awakens’ (2015) was the creation of a boy who lovingly dusted off old toys and put them through their expected poses, its superior sequel is made by a more inventive kid – maybe one with a sideline as his block’s most inspired D&D Dungeon Master –who asks: Why can’t a Rebel fleet be commanded by Laura Dern in a purple wig? Why can’t we have planets of blood-red sand, herds of rampaging alien cattle or adorable puffin-esque porgs invading the cockpit of the Millennium Falcon like wannabe copilots? That kid is writer-director Rian Johnson, previously a maker of such mind-colonising indies as ‘Brick’ and ‘Looper’. Here, he’s been given awesome licence to steer this beloved series into hyperspace. (His chapter should be studied by Hollywood execs tempted to entrust their billion-dollar properties to the humourless.) ‘The Last Jedi’ scrapes the psychologically dark edge of George Lucas’s original middle chapter, ‘The Empire Strikes Back’, but carries that grandeur with ease. 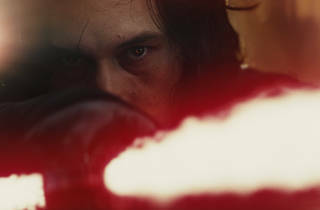 Centrally, Johnson creates a running head-to-head dialogue – almost a mystical form of FaceTime – between Rey (Daisy Ridley), rising warrior of the Resistance, and Kylo Ren (Adam Driver, as tortured as he was in Martin Scorsese’s religious-themed ‘Silence’), a furious Darth Vader in the making. Their running conversation hints at the inevitability of their meeting in the flesh; it even vibrates with a sexual charge. ‘Star Wars’ has long been a form of Wagnerian opera, but rarely has it treated space and time this pliably. Along that sturdy throughline, Johnson peppers the plot with eye-widening sequences: titanic wedge-like destroyers exploding in action scenes of off-planetary warfare; swirling lightsaber duels; the sparky comic byplay between courageous Finn (John Boyega) and a new character, a no-bull mechanic named Rose (Kelly Marie Tran); and Rey’s own experiences on a fog-shrouded island, home to none other than glum Luke Skywalker (Mark Hamill, rarely this magnetic). After taking his lightsaber and unceremoniously tossing it off a cliff – again, Johnson relishes confounding superfans – Luke slowly swings back into the spirit of things. The movie stokes the embers of radicalisation, even those cooled by personal tragedy: It’s a blockbuster about getting back on your feet, flicking the dirt off your shoulder and heading into battle recharged. That’s an invigorating idea to smuggle into big-budget entertainment. For all of Johnson’s skill in conjuring a universe of chatty droids (and crafty thieves played by Benicio del Toro, sure to be seen again), he understands that ‘Star Wars’ has always been a vessel that we, as audiences, fill with our own timely preoccupations. There’s no denying the overwhelming emotional thrill of seeing Carrie Fisher – whose final performance shows no sign of digital trickery – inspire her team of fighters from all walks of life, all shapes and colors. ‘We have everything we need,’ we hear at the rebels’ darkest hour. Johnson has taken that as his rallying cry and poured 40 years of imagineering into his own mould, emerging with an absolute winner. He’ll have to show us that Jedi mind trick someday. This film was entertaining, however I couldn't help thinking I've already seen it. There were too many similarities to the last Star Wars movie. With Luke stepping in where Solo left off. Rose was a cool new character and I think it's a bit harsh that the character and actress has received so much negative criticism from some fans. She had some very funny lines and worked well with Finn's character. The final battle was visually awesome and had a great cast (spot all the British actors with minor parts) but this had too many Star Wars cliches e.g. the casino scene, and I came away mostly with a case of deja vu. Love the worlds (what a treat to see an extravagant world in this otherwise dirty and grimy universe) but didn't feel like there were any plot advancement for the saga or character origin reveals. Fell asleep a few times during the movie. Really surprised by the mixed reviews. Am loving the Star Wars reboots & I found this latest instalment ticked all my boxes- nostalgia, witty one liners, cure creatures & thrilling fight scenes. It does what it says on the box & it was great to see Princess Leia & Luke Skywalker be given such prominent roles. So bittersweet to see the late great Carrie Fisher in her last outing as her iconic role. Popcorn movie perfection! This really didn't live up to my expectations and I was pretty disappointed. The younger members of the cast seem to play the 'unruly teenagers' trope pretty much the whole way through the film and sneak off on lengthy and poorly-planned tangents from the main story for what seems like no reason (which adds unnecessary filler to an already long film). I found a lot of Rey's actions and decisions inconsistent with the character which was built up in The Force Awakens, she seems to be impulsive and she lost the relatability that she had in the first film. The Force Awakens deliciously whetted the appetite for this latest outing in the saga. It’s visually stunning. There are the drawbacks such as unnecessary story-lines, an unusual amount of cringing induced humour and the sheer movie length. However, a true fan will overlook these deficiencies and this is the position I am unashamedly adopting. Mark Hamil’s performance is truly mesmerising and I loved the way his character has changed since the Return of the Jedi. His mentorship of Rey is central to the film as is the long-distance relationship between Rey and Kylo Ren. Since this is now a Disney movie don’t be surprised by (some might say cynical) appearance of the Porgs. Chewbacca’s alternative lifestyle choice is also due a mention. I enjoyed much of this - but it is far too long. Two and a half hours? The subplot where Finn and Rose go to a casino planet to find a code breaker is almost entirely pointless. The Rey / Kylo Ren dynamic is the dramatic heart of the movie but it is almost sidelined at times. With some skilled editing this film could have been much improved. Enjoyable but teetering on tedious. I love Star Wars now that Disney has sprinkled some of its magic on it. It's very funny and appeals to those who have not necessarily appreciated Star Wars before. My only issue is that it's an hour too long. Loved it! It feels a bit of a retelling of the original saga with different characters. In this new take women take center stage in different roles. In the original Leía was almost the only woman in the galaxy. Things have changed now and we have new role models in this overarching universe. There are some flaws like how Rey becomes such a powerful Jedi with no training unlike Luke or others before her who all needed to study the force. Rey seems to be above that. Luke character here is a bit controversial and difficult to understand at times. You’ll see. Overall I enjoyed the directing, the cinematography and the pace and wanted more. Will have to wait. There were certain things I enjoyed about Last Jedi, and certain things I found horribly frustrating. The look of it - the epic scenery, the fights - is stunning: no issues there whatsoever. However, the story is a mess: there is too much going on for any of the more interesting details to be fully unpacked. Another positive is the exploration of some of the Jedi mythology, but at the same time there is Snoke, who must be the most pointless Star Wars villain we've ever seen. Overall it is well worth seeing, but it could have done with being trimmed down. It's an enjoyable film, but far from perfect. To be able to experience new Star Wars adventures on the big screen and to pass this legend on to a new generation is fantastic - so long may it continue! For me the villains in this episode were too pantomime for deliberate comic affect but in doing this they didn’t cause a threat to anyone, nevermind the universe. Apart from this blunder, the casting wasn’t great and some of the dialogue was weak. Rogue One hit the spot I think out of the newer films - not overdoing the comedy, keeping everything stylish and Un-Hollywood, not glamourised and authentically Star Wars. Inconsistent. That’s the key word here. An inconsistent tone and pacing is a big issue, but the biggest problem is how inconsistent this film is as a continuation of The Force Awakens. There’s no need to write “No Spoilers!” here because any unanswered questions from the previous film are at best ignored or at worst crumpled up and thrown away before your eyes. Rey’s parents? Irrelevant. Snoke’s modus operandi? Doesn’t matter. What do we do Wiv Finn’s character now? Urm... give him a storyline that makes absolutely no difference to the film’s outcome. The jokes are corny, the storyline is dull and the cinematography is so very very dark for large stretches of the film that there are times you can’t see what’s going on. Perhaps as the start of the next trilogy this new tone and ripping up of previous lore would be a welcome refresh and reboot. But as the middle film to carry on the existing mythology, this ain’t no Star Wars mate. Although I’d lowered my expectations of the Star Wars galaxy after ‘The Force Awakens’ and despite the fact that ‘Rogue One’ had unexpectedly piqued my interest in the world of blue elephants & X-Wings again, overall ‘The Last Jedi’ just didn’t do it for me. I say overall because there were a few things I liked – the Porgs were obviously brilliant, utterly charming & hilariously funny, Benicio del Toro’s talents as an actor gave his lines a weight that most of the other cast seemed unable to do and the last few scenes with Luke were an utter - and very moving - joy to watch. However, in order to get to the things that I enjoyed, I had to sit through a multitude of things that made me roll my eyes, yawn and even fall asleep at one point. Asleep I hear you cry? Yes. Asleep. At nearly two and a half hours, this is a long film and despite the best efforts of the surrounding packed cinema audience to keep me awake by crunching troughs of nachos – the worlds loudest movie snack ever – I was able to have a snooze about two thirds of the way through, no problem at all. In places and for certain characters, the script is poor and sometimes makes no sense at all including the most awkward on-screen kiss I’ve ever seen in my life. It’s like Rian Johnson watched recent comic book chuckle-fests ‘GOTG2’ and ‘Thor: Ragnarok’ and decided that yes, what we needed here was jokes. Massive amounts of jokes...often wincingly delivered. I’m not saying I wanted the film to be depressing – Lord knows there’s enough darkness in the real world right now – but humour should feel honest & relevant. Returning characters weren’t given the status or storyline they deserved – oh Gwendoline – and some of the new cast members suffered the same fate, case in point Laura Dern…an A* actress who was given a C+ plotline. I feel like Oscar Isaac’s on-set direction must have consisted largely of ‘fly the ship, run, jump & shout for a bit, act amazed that a women could be so high-ranking then we’ll throw in a moment at the end where the audience knows exactly what’s going to happen in 2019, ‘kay?’ He deserved more. I loved the always wonderful Carrie Fisher in everything she did but again, found one of her most important scenes a bit cringe-inducing. There’s a lot of stuff that the die-hard fans will love about TLJ and that’s great but for me, these no longer feel like ‘Star Wars’ films. They’re kind of shooty-shooty-bang-bang rollicking adventure movies that just happens to be set in space and where the effects have squashed the script to the outer edges of quality. I’ll hang on for the last in this trilogy but reckon my time in a galaxy far far away might have reached its limits leaving me to simply dip my toe happily into the George Lucas created wonder of the original three films. I have very mixed feelings about this film because of how it change the Star Wars universe forever. I can’t decide whether that’s a good or bad thing! After all, The Force Awakens was criticised quite a lot for sticking to the formula, so Rian Johnson (Director and Writer) can certainly not be accused of that. There’s beautiful cinematography and moments of awe that are so well done they feel more at home in a ‘serious’ sci-fi film like Interstellar. There’s good moments of humour too, even if some of it feels a little too marvel-esque. And ultimately there’s a brilliant central performance from Mark Hamill - I hope this relaunches his movie career as he has a a really powerful screen presence. It’s definitely not perfect though and the running time could have been brought in to a much more digestible 2-hours if they’d cut the largely-pointless casino sequence. All in all though this is a great ride and will demand some repeat viewings. What can I say when I’m a huge fan? It’s GREAT! Full of twists and turns, action, adrenaline, occasional romance and full of new creatures that I would love to adopt. Don’t waste your time reading this and buy your tickets quickly!!!! Perhaps the most beautiful-looking SW film ever made. It is certainly (with Episodes IV & V) one of the best. An emotional, for those who care, rollercoaster! Epic. Brings balance to both the old and the new. The last jedi had the perfect mix of the star wars we all love and the development of the new characters. Beautiful scenic shots and intricate fight scenes bring forth a variety of twists and turns unseen in any of the 7 movies before hand. Would highly recommend, in desperate need of a second viewing!